PACECO ESPAÑA, a Spanish leading supplier of cranes and services for container handling, has recently signed an agreement with Klaipedos Konteineriu Terminalas, Lithuania, for the delivery of 2 Transtainer (RTG) cranes. The new 16-wheeled cranes of the latest state-of-the-art PACECO ESPAÑA design have a lifting capacity of 41t under spreader and stack 1-over-5 containers high and 6 plus 1 containers wide. They will have standard Volvo Diesel units. A reduced Total Cost of Ownership has been the key driver for developing the new Transtainer design. The new machinery boasts an efficient energy use, high availability and maintainability as well as the outstanding performance for cost-effective operations. The structural stability of the Transtainer, the rope reeving stiffness, the accessibility and cabin ergonomics are some of the new features that will provide drivers with the best working environment. The new Transtainer structural design, the new reeving and micro-motion concepts, the electronic and control platform are some of the aspects that have been developed thinking on automation. A complete plug-in automation package is available to convert the Transtainers into automatic RTGs. 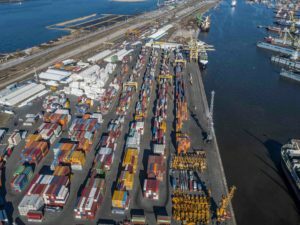 Klaipedos Konteineriu Terminalas (KKT) is one of the leading gateways at the Baltic Sea with a terminal capacity up to 450.000 TEU and the third-largest stevedoring company in the Port of Klaipeda. Founded 23 years ago, the company now handles about 12% of all dry cargo shipped through Klaipeda and 60 % of container traffic, serving 40 – 50 container ships per month. About 15 % of containers arrive and depart from the terminal by rail. KKT serves 5 container trains connecting the Klaipeda port with Vilnius, the Lithunian capital, with Moscow, Minsk, Odessa as well as with Kazakhstan and China. The increasing demand for this mode of transportation urged the terminal to expand the number of RTG cranes for handling containers from/to rail platforms. The total container throughput at KKT in 2016 was 263,529 TEU (+13% to 2015) and in the first 6 months of 2017 it reached 135 924 TEU, up 14% to the similar period last year. The double-digit growth of cargo volumes has inspired the KKT management to invest in the new cargo handling equipment and terminal development. Apart from the new RTGs, 5 new Terberg trucks have been purchased for the Ro-Ro and general cargo terminal. A new STS crane to handle larger ships is also on the agenda.